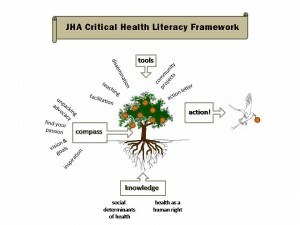 Just Health Action teaches an innovative critical health literacy curriculum which empowers individuals and communities to work towards achieving health equity. Critical health literacy combines an individual’s understanding of the social determinants of health (SDOH) with the skills necessary to take action. Our pedagogy is interactive and encourages critical analysis and reflection. Part one teaches the SDOH within a paradigm which understands health as a human right (Knowledge). Part two is composed of activities that help students find their own direction as a social change agent (Compass). Part three teaches students specific strategies and advocacy tools to take action on the SDOH (Tools). Part four helps students develop and implement a specific action intended to increase health equity by addressing the SDOH (Action). For more complete information about our educational framework, see our critical health literacy article just published in Health Promotion International. Our curriculum is intentionally adaptable. 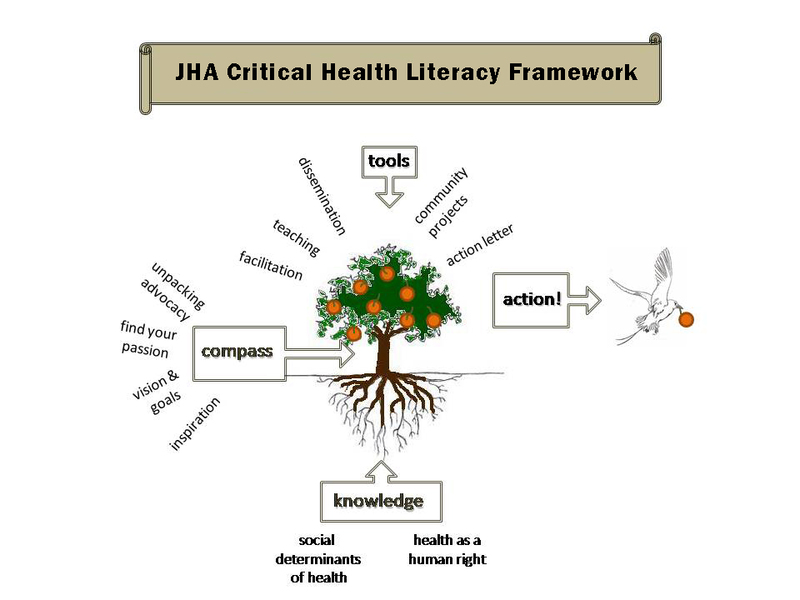 Although we always teach content from each of the four components of our critical health literacy framework, the particular knowledge topics and the number of compass and action skills we teach vary from group to group, as do the students’ final actions. Factors that determine the content are the learners’ age and skill level, the learning objectives identified by the group, and the length of time of our course or workshop. The length of our programs have ranged from a single two-hour class, to a 12-week, 100-hour course. In addition to our workshop and classes, JHA also provides facilitation and consultation services. View recent presentations made by JHA to learn more about our experiences teaching a critical health literacy curriculum across a wide range of educational settings. Contact Just Health Action for more information about how we can help facilitate action towards reducing health inequities in your community.